In ancient Greece, men often escaped their daily grind to socialize at a symposium, or formalized drinking party. In the symposium, revelers indulged in numerous leisure activities centered around the consumption of wine. Among the variety of ceramic vessels that were used, pitchers of many shapes and sizes enabled wine pourers to fill the drinkers’ cups. (1) One example is this oinochoe now on display in the new Athenian vases gallery at the Getty Villa. This head-shaped wine pitcher invites numerous questions. The first is, quite simply, how to describe it. How can curators responsibly and comprehensively create a label for this pitcher? Is this face best characterized as “black,” “African,” or “black-glazed”? The term “black” is unsuitable, because it transports our modern color politics into antiquity; the Trans-Atlantic slave trade has permanently mangled any attempt to use this color objectively. The geographical marker “African” initially seems like a sound alternative. Unlike the historical weight of “black,” using the name of a continent seems to sidestep the retrojection of slavery’s violent history. It also presents a utopian description that unites fifty-four countries and millions of people into a collective entity. To use the word “African” for this pitcher, however, is to irresponsibly project contemporary concerns onto the past. The notion of “Africa” was vague at the time of production of this vessel, around 500 BC; the Greek term for the region, “Libya,” referred generally to the northern and northeast regions of the continent. “Aithiopian” was another popular term used to describe people with black skin; the etymology of Aithiopia highlights this relationship: aithō (I blaze) + ops (face). What about our third option to describe this vessel, “black-glazed”? This term softens modern racial thinking by enabling a focus on material composition; the description recognizes color but does not subscribe to any color-based hierarchy. Although it is naïve to imagine that the black-glazed face, paired with full lips and a broad nose, does not evoke comparison with real people, I would argue that “black-glazed” is preferable because it extends beyond its modern politicized counterpart, “Black.”(2) The hyphen emphasizes its artificial status; the label reflects artistic license rather than historical prejudices. It is dangerous to fold selective history into the discussion without any reflective comments about the speculative work at play here. Although it is plausible that some black people were slaves in the fifth century BCE, there is no sure sign that this was the case in all situations. 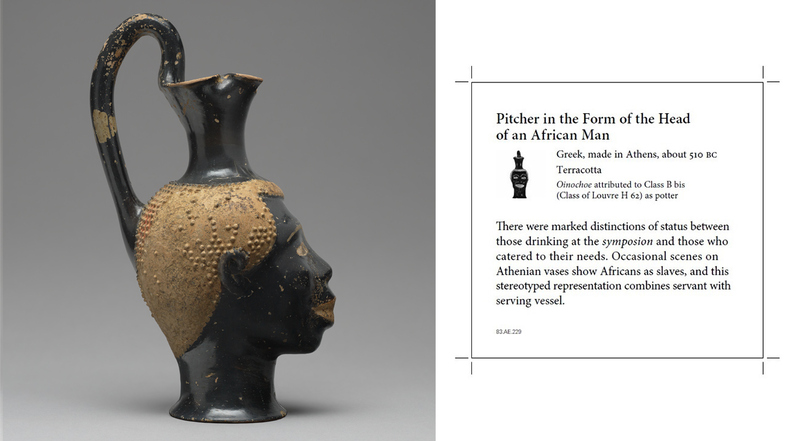 The need for careful treatment of black people in ancient Greek art extends beyond this pitcher. 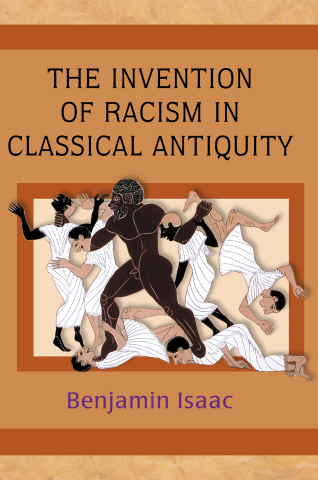 On the cover of Roman historian Benjamin Isaac’s 2004 book The Invention of Racism in Classical Antiquity, a troubling scene encourages anachronistic interpretations. Here, we are confronted with a depiction of a violent encounter between a man and six other men. 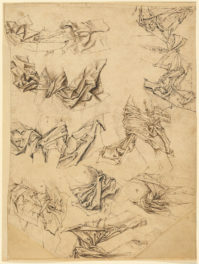 The person in the middle of the scene looms large and distinct; his upright pose and stark nakedness stand in sharp contrast to the clothed people in contorted positions around him. There are other visual clues that suggest his dominance. All of the men who come into contact with him either writhe under his feet or are firmly in his grasp. They are no match for his strength; he plows through them without hesitation. This impressive vase can currently be seen at the Getty Center in the exhibition Beyond the Nile: Egypt and the Classical World. It depicts Herakles as he resists Egyptians’ attempts to sacrifice him under the orders of the Egyptian king Bousiris. According to ancient Greek mythology, Bousiris received a prophecy that stipulated the sacrifice of a foreigner in order to stop a drought that was destroying his city. When Herakles entered Egypt, Bousiris tried to slaughter him, but the Greek hero fought back and eventually escaped. Although the visual similarities between the cover and the water vessel above are striking, the ancient image allows for a more sophisticated approach to skin color than the book cover’s partial rendering of the scene. 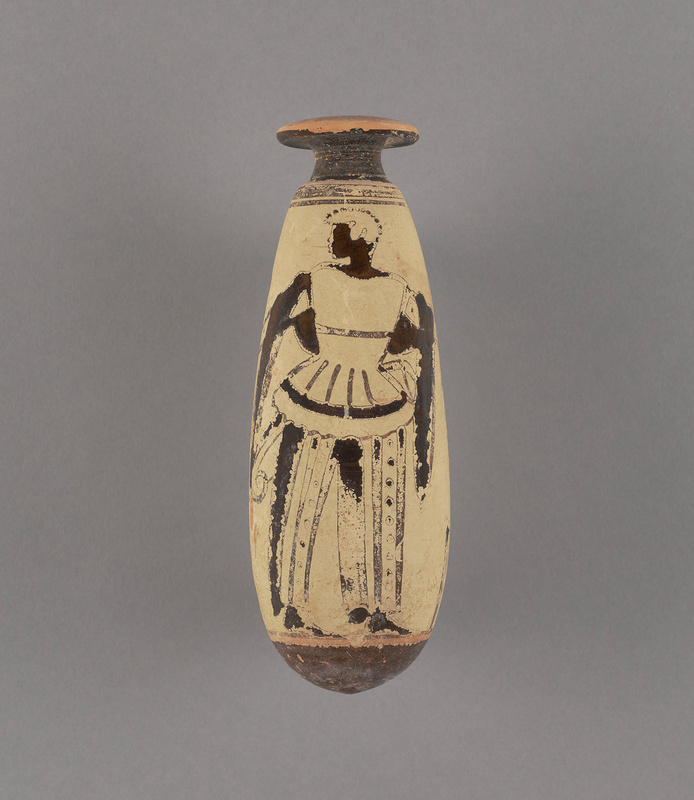 On the vase, black skin is capacious and flexible; it is not limited to those near Herakles. The crouching Egyptian priest on the left of the altar, as well as the Egyptian with raised hands to the right of the altar, have black skin. The black lines framing the scene and the black patterned designs on opposite sides of the scene also destabilize any quick interpretation of this color in antiquity. Skin color is only one element of this scene; the main theme appears to be the inverted violence that has occurred. The fear of the nine men is palpable; one has even climbed on top of the altar meant for Herakles. To add a final twist, Herakles’ skin tone on this jar is dark red. 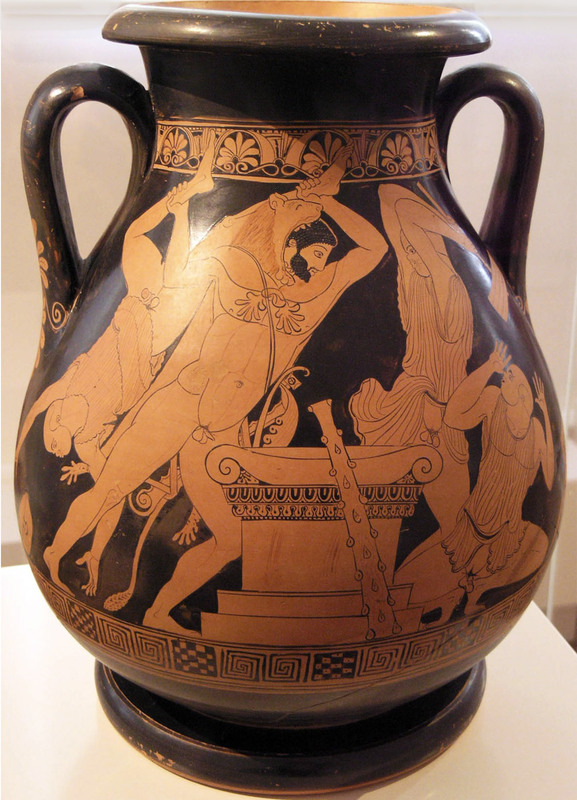 (8) Herakles’ blackness, as it appears today, is due to the worn state of the jar’s surface. There are numerous examples of this sacrificial scene on ancient Greek pottery. Another depiction portrays Herakles as a figure whose skin color does not differ from those around him. On this fifth-century BCE storage jar, Herakles (on the left of the altar) again uses his sheer strength to punish the Egyptians. But there is a different awareness of color dynamics at play on this jar. Rather than a depiction of Herakles with black skin, blackness dominates the background of this vessel. Herakles’ black hair and black beard set him apart from the bald and clean-shaven Egyptians. This does not mean, however, that his chromatic appearance is particularly important in this scene. Instead, blackness literally fades into the background. It offers a visual palette for a powerful scene rather than a reflection of color-based power dynamics. Herakles’ lion-skin cloak and club are more helpful indicators of his identity. (9) In addition, the physiognomy of Herakles marks him as distinct from the Egyptians; his long nose and thin lips stand in contrast to their broad noses and full lips. Altogether, it is undeniable that the image on Isaac’s cover reproduces an ancient representation of Herakles. But the cover art is also eerily reminiscent of contemporary discourse about Blackness. In particular, it suggests a dangerous connection between violence and the (modern) Black male body. This cover misleads anyone interested in ancient discussions of black skin because the contents of this book do not adequately address this topic. This omission encourages viewers and readers to assume that this image is an accurate representation of black people in Greek antiquity. Barring the caption on the back of the book, the image is presented without any context; people who judge books by their covers will jump to inaccurate conclusions. The permanently violent coding of black skin color is incorrect and irresponsible; there are no historical roots tracing this presumed innate threat. In sum, museum and academic scholars are key players in the fight for contextualized and equitable perspectives of black people in antiquity; they curate exhibits and write books that greatly influence vast audiences. Preconceived notions of Black people are seared into our country’s collective consciousness; without an overhaul of the “black=slaves in perpetuity” trope, damaging stereotypes become ossified as facts for future generations. 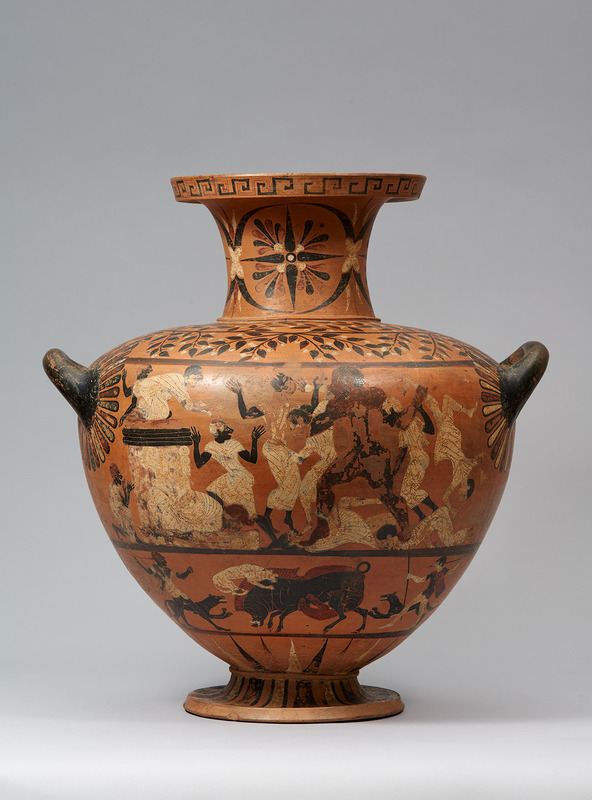 This brief examination has revealed ancient Greek art to be an expansive landscape. 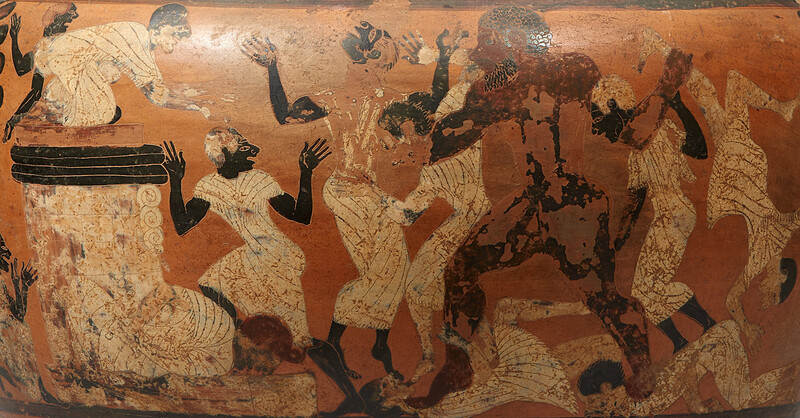 Ancient Greece’s visual heritage included representations of black people that nimbly provoked and cut across hierarchies. Objects like the sixth-century BCE head-shaped pitcher and water jar discussed above were not part of any chromatic hierarchy because such categories had yet to be codified. Instead, they existed within their own historical and artistic context. 1. 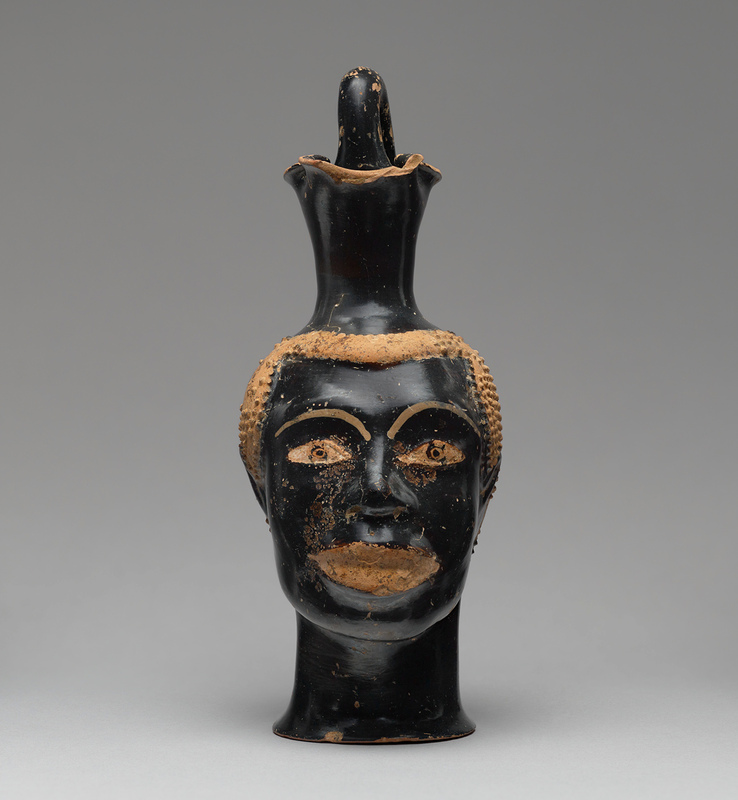 Various types of head-shaped vessels were produced around this time; see this example in the form of a woman’s head in the Getty Villa collection. 2. I use “Black” to refer to the contemporary, socially constructed group of people, and “black” to designate people who are described as having black skin in ancient Greek literature and art. 3. François Lissarrague, “Athenian Image of the Foreigner,” translated by Antonia Nevill. In Thomas Harrison, ed., Greeks and Barbarians (Routledge Press, 2002): 108–9. 5. Iliad 1.423, Odyssey, 1.22-23. 6. For more examples, see Frank Snowden Jr. “Aithiopes,” in Lexicon Iconographicum Mythologiae Classicae, Volume I: Aara-Aphlad (Artemis Publishers, 1981): 415-18. 7. For a clearer rendition of the colors on this jar, see Perseus Digital Library. 8. Jaap M. Hemelrijk, Caeretan Hydriae (Verlag Philipp von Zabern, 1984): 52-54. 9. Herakles killed and skinned a lion during the first of his Twelve Labors (feats he completed to atone for his madness-induced murder of his family). David Bindman and Henry Louis Gates Jr., eds., The Image of the Black in Western Art: From the Pharaohs to the Fall of the Roman Empire (Volume I) (Harvard University Press, 2010). This handsome volume presents vivid iconography and robust descriptions of black people in the Greco-Roman world. The first edition of this volume was published in 1976 with editors Jean Vercoutter, Jean Leclant, Frank Snowden Jr., and Jehan Desanges. Rebecca Futo Kennedy, C. Sydnor Roy, and Max L. Goldman, trans., Race and Ethnicity in the Classical World: An Anthology of Primary Sources in Translation (Hackett Publishing, 2013). Through their translation of ancient Greek and Latin sources, Kennedy, Roy, and Goldman present a comprehensive overview of the peoples of the ancient world. Selected passages (pp. 111–202) focus on northern and eastern Africa. Denise McCoskey, Race: Antiquity and Its Legacy (Oxford University Press, 2012). 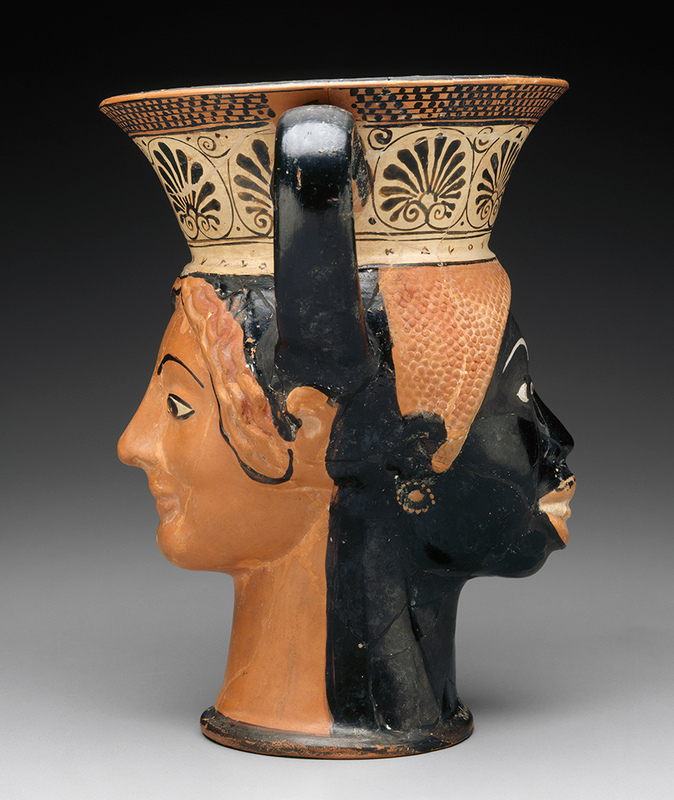 McCoskey investigates what versions of racial formation ancient Greeks and Romans utilized. James H. Dee, “Black Odysseus, White Caesar: When Did ‘White People’ Become ‘White’?,” The Classical Journal 99 (2, 2003/4): 157-67. Dee points out how easy, and how dangerous, it is to inject contemporary views of skin color into Greek antiquity. Eidolon’s journal articles about the danger of importing colorblindness and the dream of “White Europe” into antiquity. 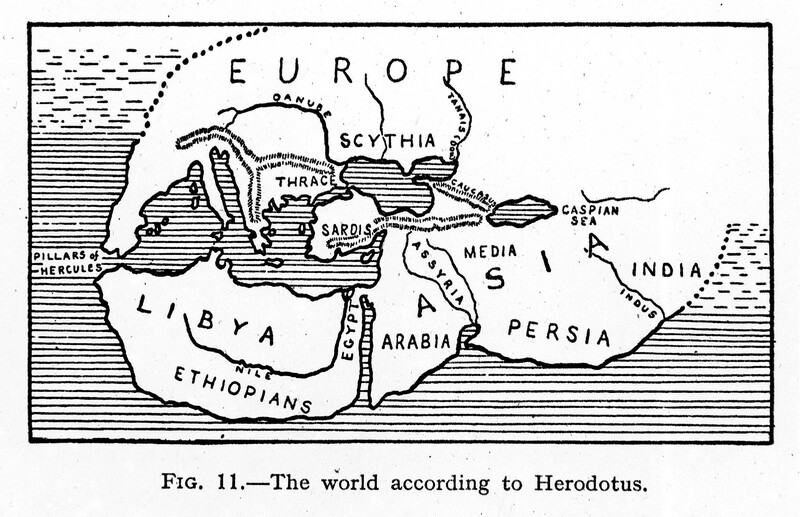 Insightful blog posts about the diversity of the ancient world by Classicist Rebecca Futo Kennedy here and here. Podcast about race and racism in the fields of Classics and Medieval Studies. 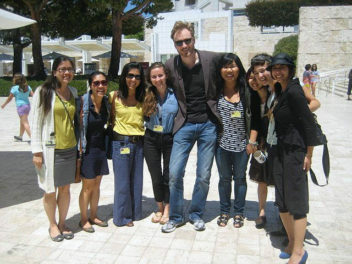 Pharos’ progressive approach to Classics via the dismantling of racist manipulations of the discipline. Along with all the broken noses, there are many examples of obvious attempts to confuse us as to racial/tribal identity (e.g., skin and hair color) of the ancients, particularly Egyptian artifacts. Forensic investigation of blackened surfaces should determine if the objects were later darkened. If truth cannot be told, we are all doomed.